Take a trip to the tropics with this easy Caribbean Salad! 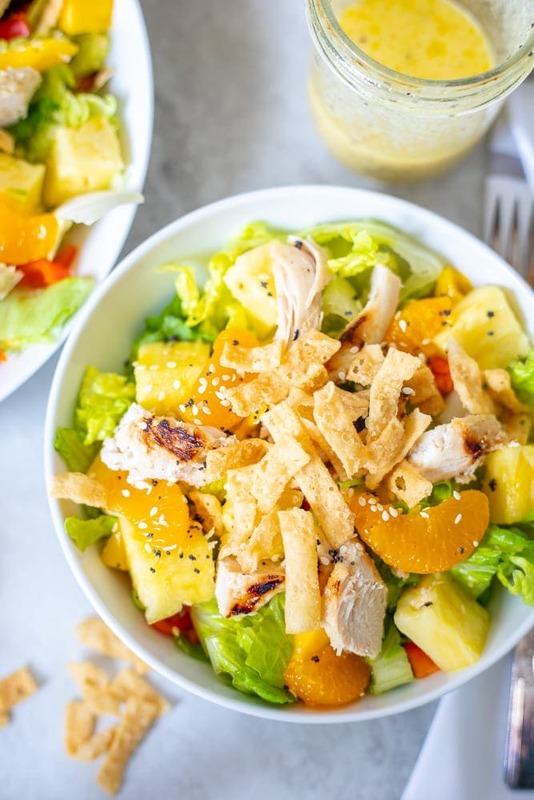 Grilled chicken is paired with fresh mangoes, pineapple, mandarin oranges, and a bright orange vinaigrette for a fresh, hearty, healthy salad reminiscent Cheesecake Factory’s Luau Salad. Looking for more salad recipes? Be sure to check out Strawberry Spinach Salad, Buffalo Chicken Salad, and Taco Salad. When my husband I first started dating, we frequented Cheesecake Factory. The restaurant happened to be close by my parent’s house and was at a fun outdoor mall that we both enjoyed walking around. While we were falling in love with each other, we also fell in love with Cheesecake Factory’s Luau Salad. Cheesecake Factory’s Luau Salad was a fresh salad made with grilled chicken, fresh mangoes, tortilla strips and a bright dressing. It has now been discontinued and replaced with a very similar salad Chicken Mango Avocado Salad. But I used my memory of their Luau Salad to create a Caribbean Salad. It is filled with fresh produce, flavor, and tastes like a tropical vacation! This entree salad that has been inspired by tropical flavors is quite easy to make. The hardest part is marinating the chicken–which is totally optional, but highly encouraged for the best flavor! Whisk together the ingredients or shake together in a glass jar. Remove 1/4 cup of the dressing. Place the chicken in sealable bag or air tight container and pour the 1/4 cup dressing over the chicken. Refrigerate the chicken in the marinade for 30 minutes up to 4 hours. You do not want to do longer than 4 hours as the citrus will begin to break down the chicken. Remove chicken from marinade and place on grill. Grill chicken for 6-8 minutes per side, or until chicken has reached an internal temperature of 165 degrees. Remove chicken to cutting board and let rest for 5-10 minutes before slicing. Chop up lettuce, pineapple, mango, and red pepper. Drain canned mandarin oranges well. Toss lettuce with fruit and then top with grilled chicken. Sprinkle with poppy and sesame seeds and serve with the tortilla strips and reserved dressing. I love the burst of flavor that mandarin oranges give this salad, but feel free to omit or use fresh, segmented mandarin oranges. Tortilla strips are found typically next to croutons at your grocery store, but crushed up tortilla chips work just as well. The poppy seeds and sesame seeds are completely optional, but do add a nice crunch to the salad. Take a trip to the tropics with this easy Caribbean Salad! 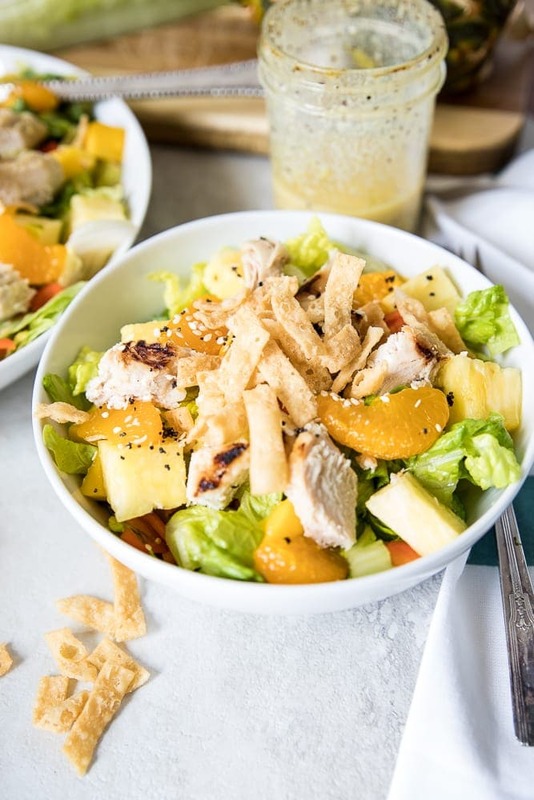 Grilled chicken is paired with fresh mangoes, pineapple, mandarin oranges, and a bright orange vinaigrette for a fresh, hearty, healthy salad reminiscent Cheesecake Factory's Luau Salad. Make the dressing by stirring everything together. Remove 1/4 cup of dressing and pour over chicken. Marinade chicken for 30 minutes up to 4 hours in fridge, prior to grilling. Preheat grill to medium high. Remove chicken from marinade and grill for 6-8 minutes per side, depending on thickness of chicken. Allow chicken to rest for 5 minutes and then dice into strips. Toss together the lettuce with pineapple, mango, red pepper, and oranges. Top with grilled chicken and sesame seeds and poppy seeds. Serve the salad with reserved dressing and tortilla strips. This looks so refreshing and flavorful! Spring in a bowl! 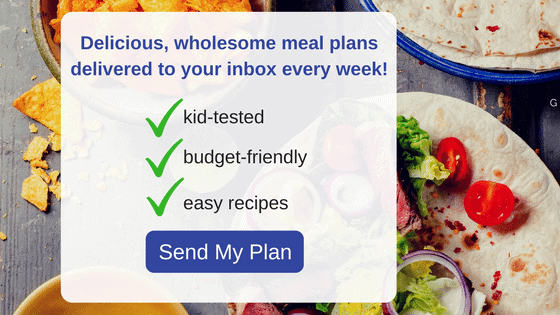 I love Produce for Kids and that you got your kids involved in the cooking process! Plus the salad looks completely perfect and delicious. Thanks Rachel. Produce for Kids is an AMAZING product. I miss having a Publix Supermarket. Great looking salad. My kids love fruits and veggies and I bet they would enjoy this salad. Thanks for the recipe. Publix is a great store for sure. This salad is great for kids–sweet and savory! Such a fantastic healthy meal! I love all that mango goodness! Aw thanks so much Judy! Gorgeous salad! The perfect salad for summer, for sure! Yum this dressing along sounds so good! Love the orange juice, especially in the summer! Love that you got the kids involved and they could be excited about salad! Your salad really sounds wonderful…wish I was having that for lunch! We don’t have any of those grocery stores in our area, but I love what they are doing! Pinning and sharing! Thanks Michelle, it is so good! 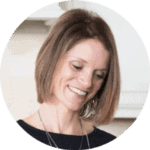 I love this cause, and I will have to head to Price Chopper to buy some Driscolls berries! We could turn into monkeys too! I love it when my kids eat chopped produce righto off the cutting board. Great salad. I love it that your kids are like mine and love fresh fruit as well 🙂 Love all this summer produce right now. This salad looks great….and the fact that my son might actually like it is a major plus. Great post! I’ve been looking for ways to shake up my lunches and this is the perfect way to do it. A hearty fresh salad and that vinaigrette sounds amazing! This salad will certainly shake your lunch up! Mangoes are the BOMB!! And yes, this dressing is pretty good as well! So bright and fresh! I definitely felt like I was relaxing on a beach somewhere while I was enjoying this. 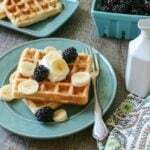 Such a great recipe for summer! SO refreshing!